One of my garden favorites for the landscape is the patio pond with its many creative uses that it brings to the outdoor landscape. The small pond SP-003 is a customer favorite for those looking for a smaller type water feature. Here at Everything Waterfalls, we love the patio ponds for the endless water garden ideas and possibilities especially when combined with our beautiful line of backyard waterfalls & creative artificial rocks. What makes our patio ponds so appealing is there's minimal digging for proper setup for flat and level areas. Excellent garden attractions for patios, decks, courtyards and even backyard landscapes where digging is undesirable. 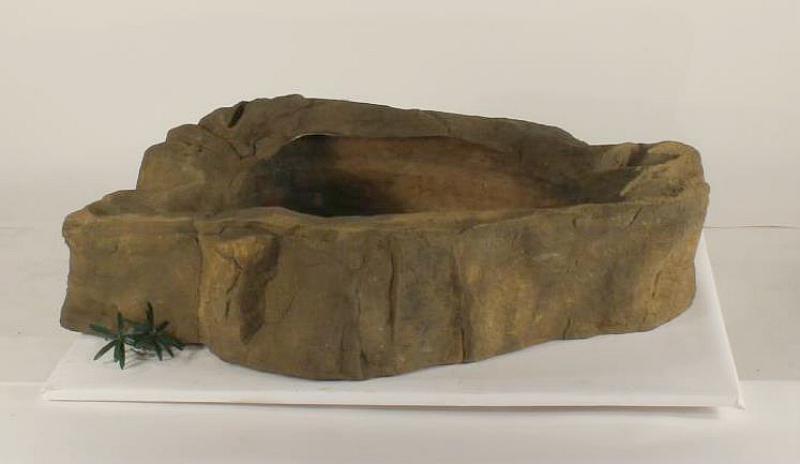 This unique rock pond comes in a two piece setup consisting of a pond basin and a decorative collar support for the complete pond look. Our diy backyard ponds are perfect for the water garden enthusiast looking to create a tropical water garden that's both quick and simple to install. Our small patio pond also comes as patio pond waterfalls kit complete with a backyard waterfalls, pump, tubing and pump rock cover. What makes our small ponds for the backyard and garden so popular for a water garden feature and an excellent alternative to many other preformed pond choices? Our artificial rocks are a special combination of polymers making them very user friendly, light weight, extremely strong while still accomplishing the complete garden pond look with natural oxides that include sand and crushed rock. This unique combination makes for a much stronger pond than plastic and rubber liner type ponds while being much lighter than cement products. Also with the decorative rock like finish that's built into our beautiful ponds the need for real rock is eliminated yet another advantage for the ultimate pond choice. All of our gorgeous artificial rocks are castings from real rock formations showing off all their beautiful crevices, cracks and rock layers like those found in nature.